Gallia Academy junior Bailey Meadows (6) receives a throw at third base in time for a force out during the seventh inning of Monday night’s OVC softball contest against Fairland in Centenary, Ohio. CENTENARY, Ohio — From double down to a double up. 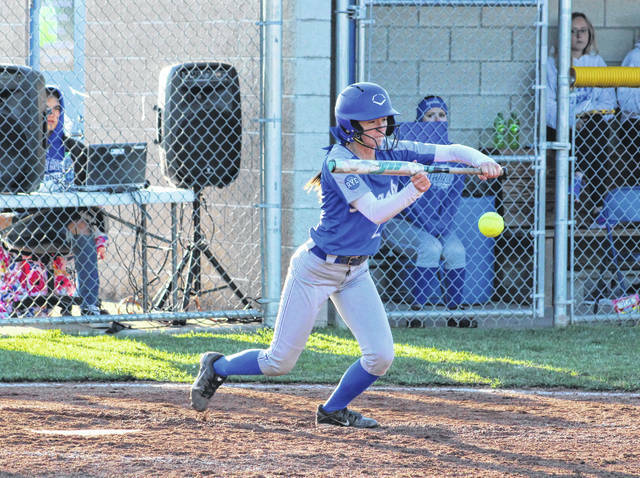 The Gallia Academy softball team scored 11 of the final 12 runs of regulation, turning a 6-3 deficit into a commanding 14-7 victory over visiting Fairland on Monday night in an Ohio Valley Conference matchup at the Eastman Athletic Complex in Gallia County. The host Blue Angels (4-7, 4-1 OVC) built a quick 1-0 lead in the bottom of the first as Alex Barnes scored on a sacrifice fly off the bat of Malerie Stanley, but the Lady Dragons countered with two runs in the top of the third as Judge delivered a one-out single that allowed both Hoffman and Clark to score for a 2-1 edge. Kyla Miller received a leadoff walk to start the bottom of the third, then Preslee Reed entered in as a courtesy runner for Miller. A pair of bunt singles loaded the bases with nobody out, then Reed scored on a wild pitch that tied the game at two after three full frames. The Green and White, however, got RBI singles from Hoffman and Judge with one away in the fourth, then Clark scored on a two-base error that gave the guests 5-2 advantage. Bailey Meadows scored on a wild pitch in the fourth and trimmed the deficit down to 5-3, but the Lady Dragons answered in the top of the fifth as Carroll scored on a fielder’s choice while extending the lead back out to three runs. GAHS made its first big push in the home half of the fifth after sending nine batters to the plate, which resulted in five runs on five hits and an error while reclaiming the lead at 8-5. After Stanley and Meadows produced RBI singles that cut the deficit down to 6-5, Abby Hammons delivered a three-RBI single to left that plated Bailie Young, Meadows and Reed with the tying and eventual go-ahead runs. Bowman led off the top of the sixth with a solo homer to center, but the guests were ultimately never closer the rest of the way. 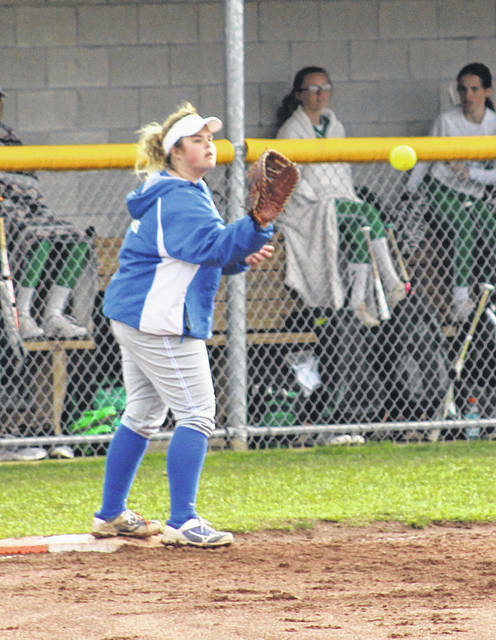 Gallia Academy sent another 10 batters to the plate in its half of the sixth, which led to six runs on four hits, a walk and two FHS errors. All six runs also crossed home plate with two away in the frame. The Blue Angels outhit the guests by a 12-10 overall margin and both teams committed four errors apiece. 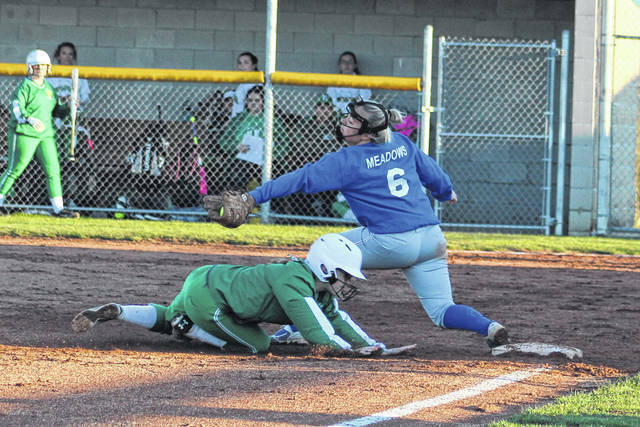 The Lady Dragons stranded 11 runners on base, while the Blue and White left only five on the bags. Hunter Copley was the winning pitcher of record after allowing five earned runs, 10 hits and three walks over seven innings while striking out nine. Hoffman took the loss after surrendering six earned runs, 13 hits and three walks over six frames while fanning six. Meadows led the hosts with three hits and three runs scored, followed by Barnes, Stanley, Copley and Hammons with two safeties apiece. Hammons drove in a team-high four RBIs and Meadows also knocked in three RBIs for the victors. Hoffman, Bowman, Judge and Blake paced FHS with two hits apiece, with Carroll and Boling also providing a safety each. Judge knocked in three runs and Hoffman also drove in a pair of RBIs. This contest was originally scheduled to be played at Proctorville, but the game was moved to GAHS due to the wet conditions of the Fairland fields. Gallia Academy returns to action Wednesday when it hosts Ironton in an OVC contest at 5 p.m. The Blue Angels will also make up their rain-out date with Coal Grove on Thursday in Lawrence County.